What is a Seedling Planting? A seedling is a young tree and is generally defined as a tree that is less than three feet in height. A seedling tree planting is simply a tree planting event using young trees. Seedling tree plantings use different methods than planting balled and burlap trees. 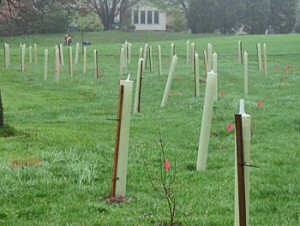 In general seedling plantings are preferred when an entire area is being forested, for example in planting a riparian forest buffer. Unlike planting balled and burlap trees, one does not expect all of the planted seedlings to survive and so they are planted in greater numbers. Why Should I Plant Seedling Trees? Trees provide many benefits to humans and the environment including producing cooling shade that reduces energy costs in the summer and providing breaks from the wind thereby reducing heating costs in the winter. Additionally trees have been shown to improve air quality, store carbon, and reduce noise levels. Trees also produce some non-environmental benefits including an increase in property values, community pride, and human health. However, the reason we have included tree planting in this toolkit is because of the benefits trees provide for watershed health. Planting trees can reduce soil erosion, runoff, flooding, and non-point source pollution (i.e. water pollution that cannot be traced to a single source—for example, polluted runoff from roads). Trees also benefit watershed health by recharging groundwater and sustaining steam flow. Trees provide these services to our watershed because they are like mini-reservoirs. During a rainfall event they capture and store rainwater on their leaves and branches, releasing it more slowly to the ground. By trapping rainfall, the water never leaves the site where it fell and therefore cannot become runoff that picks up pollutants and sediments and carries them to local streams. Additionally, the water that is captured by trees slowly percolates into the ground and recharges the groundwater that eventually will help augment stream flow during dry periods. Furthermore, trees planted next to streams help hold the stream banks in place, reducing erosion. They also supply food and shelter for fish and other wildlife. Always consider your goals before developing your budget. It is better to dream big and come up with a well thought out project than to cobble together a plan based on the money that you have on hand. Having a great idea and a plan for implementation can help determine funding sources and can also help convince potential funders of the merit of your project. Once you have your project goals laid out, modify the project to fit the realities of your budget. Seedling trees are not expensive, however proper maintenance of the plants and planting site before and after planting can take time and money. It is important to have a plan for the care of your seedlings so that they survive to create the forest you intended. You may be planting trees on farmland that has been retired or you might be planting trees in a stream flood plain to help stabilize its banks. 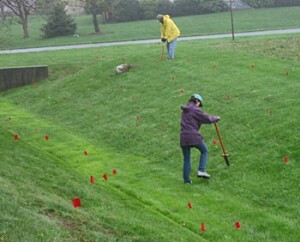 You might be working on a school grounds to educate students and reduce school maintenance costs or helping homeowners create watershed-friendly landscapes on their property. Whatever the case, you will want to write out your specific goals and let them guide your work plan. The cost associated with planting seedling trees is comparatively low. Costs range between $0.50 and $1.50 per seedling for the smallest seedling orders (generally 100 seedlings). If money is available and you are not planting a large area, consider planting larger trees that have a better chance of survival. However, if you are planting a large area or your budget is limited, seedling tree plantings can be effective. Remember also to consider the cost of maintaining the trees after they have been planted. This may involve water costs, the cost of renting mowers or other equipment to keep the area clear, and the time of those maintaining the site if they are not volunteers. First check with your state’s Department of Forestry or your local forest extension agent (links are in the Resources section below). Many jurisdictions grow seedlings that they plant on their lands and provide free or at a reduced cost to landowners and groups interested in tree plantings. They can also be helpful in providing technical assistance for your tree planting and they may welcome a partnership to help plant trees and care for them once they are in the ground. You might also check with your local nurseries. They may be interested in helping defray the costs of your planting in return for some publicity or they may be able to give a discount for purchasing through them in bulk. Two other ways of financing a tree planting project are to have individual purchasers or sponsors pay for trees or to seek out funding through grants and donations. Some tree planting projects are paid for through a combination of the two methods. Whichever method you choose will affect your work plan. If the seedlings will be planted on public land such as in a schoolyard or at a library or parkland, grants are often available to fund planting events. Grantors include the Chesapeake Bay Trust, the Chesapeake Bay Foundation, Pennsylvania’s Growing Greener Program, the Chesapeake Bay Restoration Fund (Va.), and the National Fish and Wildlife Foundation’s Chesapeake Bay Stewardship Fund. Your local government also may help pay for the seedling planting. If the seedlings will be on private lands, the options for financing are much more limited. If the seedlings will be planted in a business park, ask the businesses located there, the property manager, and the property owner to help finance the project. Let them know that tree plantings can reduce landscape maintenance costs, reduce stormwater utility fees, and increase property values. If the seedlings will be planted on an individual homeowner’s property, the costs should be reasonable enough for the homeowner to absorb. The act of planting seedlings is relatively straightforward, however there is a lot of additional work that must take place before and after the trees are put into their place. Remember that the best time to plant seedlings is in the spring or fall, depending on the species. Consult your area forester for the best planting time in your locality. Freezing weather greatly reduces the tree’s chances of survival. Seedlings should not be planted during freezing weather or into frozen ground. Hot weather may also reduce seedling survival. Below is a list of materials that you may need for your planting event. The exact materials will depend on the number of trees that you are planting and the conditions of the soil at the planting site. Once you have chosen the general location of your planting area, get to know it better. Look at the geometry of the area so that you can design your planting to be aesthetically pleasing. Determine the size of the area and determine the proper number of trees. Look at the infrastructure of the site—are there overhead power lines? Are there fences or buildings? Are there trees already present? Look also at the light that the area receives, thinking not only of the light received at different times of the day, but also during different seasons. Look at the topography of the site, the soils, and how rainwater will move on the site. Are there steep slopes? Will the trees have to sit in water during heavy rains? Is the soil well-drained? Securing landowner permission to plant on the site!!! It’s crucial that you get written permission from the local government if the site is a public area or from the landowner if the land is privately held. This will save you from liability issues if problems arise during or after the planting. Determining who will care for the trees during the first two years after their planting. If you cannot find someone to take care of the plants, there is no sense in planting them. If necessary, the person or persons that will be maintaining the trees will need written permission to access the property where the plants have been placed. Once you have examined your site and determined its characteristics, you should use this information to guide your tree selection. Most trees will do well in well-drained sunny plots on level ground, but not all trees will be able to survive in moist, shady areas. Consult your local forest extension agent or nursery for trees that are appropriate for your conditions. In most cases, trees native to the area where the planting will take place are the best choice for a project. The day of the event, break up your volunteers into groups of two to three volunteers to work with a team leader. The team leader will work with the volunteers to ensure the plantings are done correctly and give advice when necessary. Improper care of seedlings between delivery and time of planting is one of the greatest causes of their mortality. Seedlings have the best chance of survival if they are planted as soon after they are received as is possible. If they cannot be planted right away, the seedlings should be stored in a cool place and their roots should be kept moist. One method is to submerge the roots and soil of seedlings in water for 10 to 15 minutes but do not leave the trees in water for over an hour as this can kill them. If your seedlings have come as bare root bundles, leave them together and store in a cool place (under 50 degrees Fahrenheit) if planting is to occur within 48 hours of delivery. Dig a trench deep enough and wide enough to hold all the roots without crowding. Ten feet of trench will hold about 1,000 seedlings. Cut the strings on the bundles of seedlings and place the roots in the bottom of the trench and spread out the roots. Water the seedlings. If the soil is dry, water it thoroughly. Keep the roots moist at all times. Cover the seedlings’ roots with soil and pack firmly. Air pockets will allow the roots to dry out. There are two types of seedlings that you can purchase: bare root seedlings and potted seedlings. Each has its own technique for planting. For bare root seedlings, mix a shovelful of soil in a five gallon bucket half-filled with water. Open the bundle and place seedlings immediately into the bucket, submerging the roots in the mixture. Plant as quickly as possible. For potted plants, remove the seedling from its pot being careful to not break the root ball and plant them immediately. Dig a hole, deep and wide enough to freely contain root (at least one foot in diameter). You can also insert a dibble or planting bar into the soil, making sure to dig straight down, and pull backward to open hole. Plant the seedling. Make a small mound of soil in the bottom of hole, take the seedling from the bucket, and spread its roots out in all directions using the mound as a root support. The seedling roots should be in the hole as straight as possible. 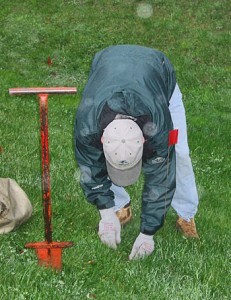 Thus, holes must be deep enough so roots are not crammed into “u,” “j” or other “curled up” forms. Deformed root systems as a result of poor planting may persist for a lifetime with consequences to the tree’s health. Place the seedling at correct depth (the depth of its root collar – where it was planted in nursery), packing roots with moist soil. Fill-in the soil around the tree. Pull loose soil back over roots, filling the hole half way. Lightly tamp soil down or fill it with water. Then, back fill the rest of the hole, tamp soil again or re-water. Do not compact the soil by tamping wet soil! Compacting the soil eliminates air which the tree needs to survive! For potted seedlings follow the same planting instructions as for bare root, but do not disturb the roots. Make sure the root ball does not become exposed after final watering. Maintenance of seedling plantings for at least two years after their planting is crucial to their success. Keep this in mind when planning a seedling planting and make sure to have a signed a maintenance agreement before planting. If you cannot find someone to take care of the plants, there is no sense in planting them. Water each seedling with one to two gallons at planting time. 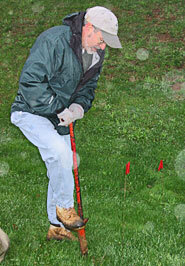 For the coming months, periodically check the soil moisture by digging up soil near the plant. A mulch is recommended to conserve water. Mulch reduces weed competition and water loss from the soil. Mulch allows rainfall to pass to the soil while reducing the number of weeds and permitting oxygen exchange between the air and the soil. Eliminate weeds around each seedling for at least two feet. This may be by accomplished by using mulches, hand pulling, mowing (watch out for the seedling), hoeing, or chemically treating. Roundup® herbicide can be sprayed, under low pressure, on weeds near seedlings. Cover seedling with bucket or use another form of shield to keep spray off seedling. 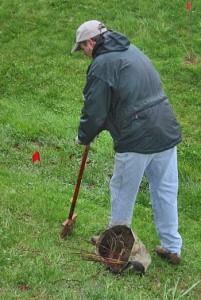 When hoeing, use care to avoid damage to shallow roots.